George Eward Foreman, simply known as George Foreman, is a famous American boxer, author, minister of religion, actor, as well as an enterpreneur. George Foreman rose to prominence in 1968 when he won the heavyweight boxing gold medal at the Olympics, and several years later defetead another famous boxer Joe Frazier and became the World Heavyweight champion. George Foreman is also known as one of the competitors in a legendary match called “The Rumble in the Jungle”, which took place in Zaire. It was Don King’s first venture as a professional boxing promoter, and it also turned out to be one of the most famous matches in the history of boxing. Even though George Foreman lost to Muhammad Ali in 1974, the iconic match is still prominent in the media. Two movies, namely an award-winning documentary called “When We Were Kings” and a film “Don King: Only in America”, were largely based on “The Rumble in the Jungle” match. Such artists as “The Fugees” who together with Busta Rhymes, A Tribe Called Quest and John Forte released a song in honor of the event, while “The Hours”, The Game and Johnny Wakelin also contributed with singles based on the match. Considered to be among the greatest heavyweights of all time, George Foreman was inducted into the International Boxing Hall of Fame and the World Boxing Hall of Fame for his immense contributions to boxing. 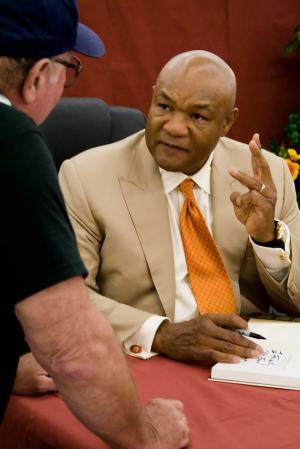 A famous former professional boxer, how rich is George Foreman? In 1990, Foreman won $12.5 million in his match against Evander Holyfield, and in 1999 earned $200 million when he sold his naming rights to the grill company that later became “George Foreman Grill”. George Foreman was born in 1949, in Marshall, Texas. As a teenager, Foreman was rather troublesome, since he left high school and instead joined “Job Corps” before he moved to Pleasanton. Foreman was inspired by his idol Jim Brown and initially desired to become a football player. Yet eventually he gave up his interest in football and instead focused on boxing. As a boxer, Foreman achieved his first major victory in the 1968 Olympics event, which helped him gain a lot of media exposure and secured his future as a professional boxer. Throughout his lengthy career, George Foreman had an opportunity to fight against some of the best boxers in the world, including Muhammad Ali, Joe Frazier, Ken Norton, Jimmy Young, Evander Holyfield, and Shannon Briggs to name a few. Foreman retired from professional boxing twice, first in 1977 when he unofficially stopped fighting for several years, but made his return in 1987, and second time in 1999 after his loss to Briggs. In addition to being a professional boxer, Foreman also ventured into business and in 1994 started promoting grills manufactured by Spectrum Brands, to whom he later sold his naming rights. The grill is now named “George Foreman Grill” and it has currently sold more than a million units around the whole world. A famous former professional boxer, George Foreman has an estimated net worth of $200 million.